Southern Boys Weekend in the Gunnison River Valley! It's that time of year again to head to one of my favorite areas in the state. Our trip has been in the planning for a few months and I couldn't wait to entertain my Georgia and North Carolina buddies. This area can be absolutely gorgeous one minute and one of the coldest in the state the next. The trout treated us well and the Salmon made us feel like we were in Alaska with all of the Sockeye's we caught. 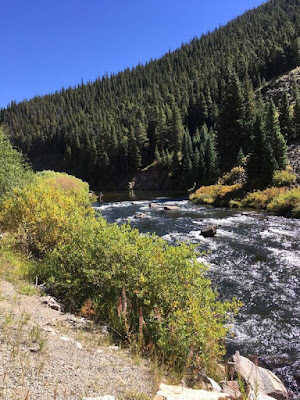 the Black Canyon of the Gunnison region for some Fall fishing. Beautiful weather and a few hatches made this well worth it. The Gunnison is one of the top areas for big rainbow and brown trout, and the isolated, narrow Black Canyon is one of those places that inspires or keeps you coming back year after year. The best way to thoroughly explore the area and get a real feel for this awesome river is to take a float trip through it and spend several days working on flies and getting tips from experienced guides, such as those with Black Canyon Anglers, a longtime outfitter on the "Gunny."